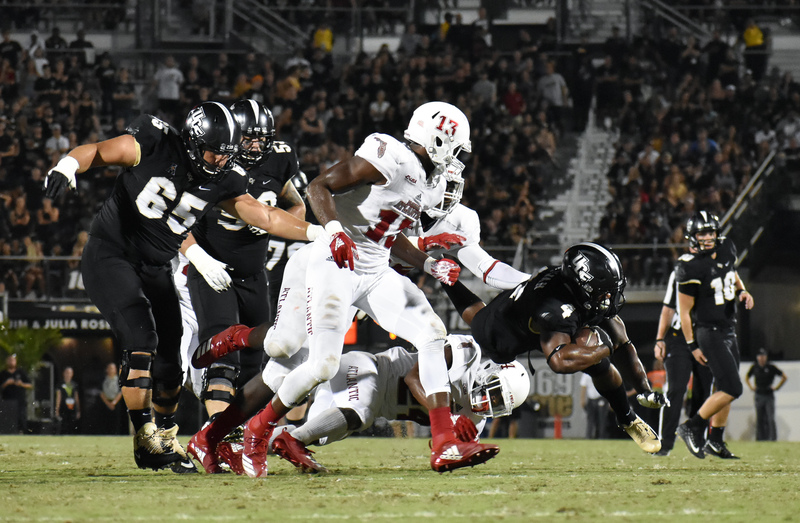 UCF came out hot in the 1st quarter in this much anticipated in-state game against the FAU Owls. Right out of the gate, the Knights drove down the field with ease with McKenzie Milton leading the way. As Milton opened up the scoring with a 12-yard touchdown run, his first of the season, to put the Knights up 7-0 after Matthew Wright chipped in the extra point. Shortly after, the defense got a quick stop which put the ball back in the hands of the offense. The offense repaid the favor by putting another 7 points on the board after Milton hit Dredrick Snelson on a 12-yard touchdown pass, pushing the score to 14-0. After the hot start on offense, the Knights stayed pretty stagnant throughout the rest of the half. It was FAU who started to pick up on offense. FAU’s star running back Devin Singletary exposed the UCF defense and became the Achilles Heel of Randy Shannon as Kiffin dialed in more of the run game. Aside from the interception by linebacker Pat Jasinski, the Knights defense could not stop the Owls offense. Singletary ended the first quarter with an 11-yard touchdown run, making the score 14-7. FAU continued that momentum into the 2nd quarter as Singletary evened the game at 14-14 with another rushing touchdown– this time for 9 yards. The 2nd quarter stayed quiet until FAU marched down the field again and kicker Vladimir Rivas kicked a 32-yard field goal, giving the Owls their first lead of the game. This made the score 14-17 with 1:34 left in the half. 1:34 proved to be too much time for Heisman hopeful Mackenzie Milton. Milton drove the Knights down field and threw a 21-yard touchdown pass to receiver Marlon Williams with 31 seconds left. This put the Knights up 21-17, giving them some momentum going into halftime. The Knights used that momentum to their advantage and showed off that high powered offense to start the second half. Milton and the offense pushed the ball downfield to open up the half and turned the first drive into points. Milton ran the ball in for another touchdown, this time for 9 yards, increasing the Knights lead to 28-17. The defense found a way to slow down the Owls offense in the 3rd quarter giving the offense the ball back once again. Milton ended yet another drive with a rushing touchdown, his third of the game, for 13 yards making it 35-17 in favor of the Knights. FAU was not done yet though. Lane Kiffin and his offense answered on the next drive with a 23-yard touchdown pass from Chris Robinson to Kerrith Whyte bringing the game within reach at 35-23 after a failed two-point conversion. UCF did not back down as they got the ball back and got more points up on the board after a 19-yard touchdown reception by Gabe Davis from Milton making it 42-23. The Knights defense kept the momentum going with an interception by Eric Mitchell to end the 3rd quarter. The Owls offense responded in the 4th quarter with Devin Singletary rushing for his 3rd touchdown of the game for 5 yards making it 42-29. All the Knights running backs stayed quiet for most of the game, Taj McGowan broke that silence late in the 4th. McGowan rushed for 3 straight plays and punched it in on the last try for a 6-yard touchdown run putting the game out of reach with 3:04 left at 49-29. The Knights defense was not ready to just lay down and end the game though. They came out on the next FAU possession and got thier 3rd interception by linebacker Shawn Burgess-Becker who took this one to the house putting the game away at 56-29. FAU did score on the following possession on a 40-yard run by Kerrith Whyte for his second touchdown of the game, but it was too late at this point. The Knights beat FAU 56-36 with outstanding performances from guys like Milton who went 21-32 for 306 yards and 6 touchdowns, tying his touchdown record for a game. Also, from all three starting linebackers getting an interception apiece. The Knights look to continue their win streak next week against a huge ACC opponent in PITT at home in Spectrum Stadium.